This has probably been done before but was thinking today what must be the most vague destination displayed on bus blinds. Must be loads more which locals would know but if you new to London you probably wouldn't have a clue. How's this? Just "Harrow" on routes terminating at Harrow Bus Station - routes 223, 340, 395, 483 and the Harrow H Routes H9/10, H11, H17 & H18/19. Locals know buses are heading for Harrow Bus Station (apart from the 395 which terminates one stop before the bus station at a stop/stand called Kymberley Road). It does seem odd to me though. Most of Transdev's DPS/SDP Plaxton Pointer batch along with First's DM/DML Marshall Capital batch from before 2011 had the "Bus Station" qualifier along with the name "Harrow", but buses from 2011 onwards (such as the Enviro 200s and Gemini 2s) just say "Harrow". I don't know why. Although, I have noticed a new "Bus Station" qualifier on the 483's VWs. Thamesmead East on the 180 springs to mind, as the curtailment point is actually much closer to Belvedere, and isn't very specific at all. Plain Chiselhurst now shown on the 161 as well. Southwark Park Road on the 1 is also very vague, especially since the bus doesn't actually serve any of Southwark Park Road if curtailed there (the last stop is on Grange Road), although a little caveat is it isn't actually on the blind, I think they just forgot to order it, as per Abbey Wood on the 180 (which also wasn't present on the blinds until recently). So where is in Chislehurst... ah... 61 end up at Gordon Arms, 161 end up at War Memorial, R7 end up at Sainsbury. Every route that terminates at Barking. 169 displays Barking and the 287 and 238 also displays Barking but they terminate at different parts with 287 and 238 terminating at Barking Station and 169 terminating at Barking Town Centre. Only exception is the 687 which displays Barking Station when terminating there. Isn't this the curse of every bus network though? I know London has had a long history of via points etc on blinds but many other places have no such legacy. It is almost always the case that a visitor / non resident / new arrival will struggle with however a transport service is described because they won't know the geography. When I grew up in Newcastle the local buses sometimes just displayed "Service" or "Duplicate" and the route number. Others had things like "Throckley" or "Cowgate Circle" and yet people learnt what bus went where and were able to get about. There was no internet, no next bus signs, no route maps at bus stos, no timetables at bus stops. 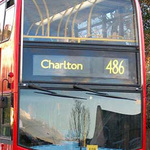 Often there were no route numbers displayed at stops. You had to make a bit of effort to get a timetable and a map or, more likely, your parents took you on the bus or the train and taught you how to use it and when buses were due and what one to catch. I don't specifically recall being taught how to read a timetable or having specific "lessons" from my Mum (Dad drove and didn't really take us on public transport) but somewhere the info sunk in. As I've said before I only "learnt" London's geography and layout by forcing myself off the tube and on to the buses so I could see what the streets were like. Bus maps were a great help. Don't know how I'd do it now with the reduction in Central London routes and absence of detailed paper bus maps. I don't really worry about London's blind displays. It's not as if "Angel Road Superstores" is any real impediment to people boarding the 341 at Waterloo or Clerkenwell or Islington or Newington Green. London almost always has stop info which gives a reasonable clue as to where buses are going and when. 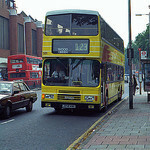 "Blackheath" on the 386, when it was extended to Blackheath Village - huge confusion because the route already went through Blackheath Royal Standard. Now amended.